i just cannot imagine how dumb people must be. i saw this auction on ricardo.ch, where a guy sells his firewire-drive enclosure and thought, well 30 bucks seems like a fair price for it (to make me an external hd, because my ibook comes to it’s limit..). Ain’t that the autobid feature? At least for the first user (look at the bidding times!). That still doesn’t explain the highest bidder, though. That is, if Wwwdomich would have had an autobid limit, too, then he should appear twice, too, shouldn’t he? 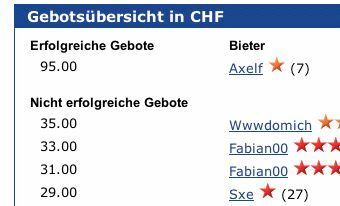 the first bid of fabian00 after mine is shurely an autobid, but the second was done about a day later, so he must have messed something up.